Our 2018 - 2019 season is in full swing at Gibson Ranch Park. As usual stay tuned to these pages (or the sarg-announce mailing list) for any late-breaking changes. Launches are from 10:00 am thru 2:00 pm with setup starting at 9:00am. Any help with setup and teardown is always appreciated. The launch was fantastic! With 174 flights, it was the busiest launch we’ve had in quite some time. We were joined by a group of Scouts, nice job on all your rockets, Scouts. We also saw several TARC teams busy getting ready for qualification. Best of luck to all the TARC teams. SARG enjoys supporting young people learning about real applications of math and science. We hope to see you again soon. The weather couldn’t have been much better - Plenty of sunshine, a little bit of a breeze, and very pleasant temperatures. There were lots of interesting launches, and a couple of very interesting ones :-). The launch equipment worked well. And we enjoyed the new canopy provided by Dr. Matt Comfort. Thanks, Matt! Thanks again to Bay Area Rocketry. 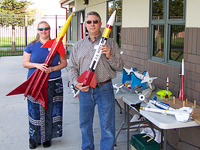 We are very fortunate to have a rocketry vendor on-site for our launches. Thanks for the support, Mike! All you need is a model rocket and some motors! We have the pads, rods and electronics to get your model rocket in the air. At Gibson Ranch we can handle "low-power" (motor sizes "A" thru "D") and "medium power" (motor sizes "E" thru "G") rockets. Sorry, no high power motors of any kind. Our ceiling at Gibson Ranch is 1500' above ground level. Yes, this means we still may not allow you to fly that "G" motor if we think you'll break our ceiling. Non members are are always welcome but must sign a RELEASE FORM before launching. All fliers need flight cards filled out for each flight. Flight cards are available both at our launches and on our download page. Our non-member launch fee for individuals is $10 and $25 for groups. TARC groups always fly for free. Please note that Gibson Ranch charges $5 for parking. If you are new to model rocketry, please review the California Code of Regulations for Model Rocketry. You may also visit our Resource Page for helpful hints on building and flying model rockets. Our Vendors Page offers a comprehensive list of local and online vendors. Want to launch rockets for free? SARG membership costs $25 per year for individuals or $30 per year for families. Family membership covers all family members of any age. Membership allows you to fly rockets at our launches for free as well as vote in our elections -- and yet still helps us pay for the equipment that we use to conduct our launches. Membership is open to everyone who wants to participate in this fun and safe hobby. Many of us are what our hobby calls "born again rocketeers." We caught the bug as kids during the peak of the space race but left it behind as we grew older. When the kids and grandkids came, the fire was rekindled. We also have many young members who teach the old dogs new tricks with their mastery of building. We are a very social group and enjoy chewing the fat at the launches almost as much as flying rockets. So come to our next launch and check us out. Chances are, you'll get bit by the rocketry bug as well! We also highly recommend membership in the National Association of Rocketry or the Tripoli Rocketry Association. We have two mailing lists to keep folks up to date, both hosted by Google Groups. You can subscribe to them by clicking on the links below. sarg-announce@googlegroups.com - Our announce-only list with information on launches, meetings and special events. sarg-general@googlegroups.com - A general purpose list for discussions on rockets and rocketry. SARG launches are on the fourth Saturday of each month. Check the main page of our website the day before each launch to check the status. The primary SARG launch site is at Gibson Ranch Park, in the north-west corner of the park (in the "overflow parking area"). Our non-member launch fee is for individuals $10 and $25 for groups. This is a one-time fee that covers all flights. Non-members must also fill out a RELEASE FORM. Our flight ceiling at Gibson Range is 1500' above ground level. Gibson Ranch Park charges a $5 parking fee. We are extremely fortunate to have access to this property. Anyone violating the rules below may jeopardize their right to return. Anyone not respecting the property will be asked to leave and will not be invited back. Visitors / observers are welcome. Please understand that rocketry, even when all safety codes are followed is a potentially dangerous activity! At Gibson Ranch Park we allow only low and medium power rockets. No exceptions. Keep children under control at all times. There are several small "ponds" in the general area. Never catch a descending rocket. Leave absolutely no debris of any kind behind when you leave. Do not cross barriers to launch field unless directed by Launch Control Officer (LCO). Observe all posted range rules or verbal instructions of a SARG officer or launch committee member. The members of SARG recognize the educational potential of model rocketry and stand ready to fully support the area's youth groups looking for a safe place to launch their model rockets. Our launch equipment is capable of handling 8 low power rockets at a time, so we can handle large groups easily. Our group fee is $25 which gives every member of the group unlimited launches for the day. For additional information, contact our Youth Group Liaison Officer. Contact us when you plan to participate in a launch so that we can expect you. You bring the kids, rockets, and motors. We supply all of the launch equipment. To save time, download some flight cards from our download page and have them filled out before launch day. You will get through the safety officer and onto the launch pad quicker. Bring water, snacks,and sunscreen. On hot days, an E-Z up will be useful. There are no trees on the launch field (they like to eat rockets, so we avoid them). In addition to the low power launches, some of our members will be launching mid power rockets as well, so be prepared for a show. Review the MODEL ROCKETRY SAFETY CODE with your group members before the launch day. You can find the club rules on the LAUNCH & MEETING SITES tab above. All forms are always available at the launches. To join SARG, we have a Membership Application. For non-members we do require a Release and Waiver of Liability Form on file for every launch. Each flight will require a filled out Flight Card to help us keep track of what we're launching and who it belongs to.